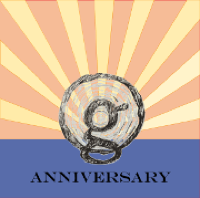 Celebrate literary non-profit Old Growth Northwest‘s first year this Sunday, June 8 (yes, that’s tomorrow) from 4-6 p.m. at Vermillion Art Gallery in Seattle! Created by a group of super-smart, inspiring individuals, we’ll raise a glass to all they’ve contributed to Seattle’s literary landscape: an array of sliding scale writing workshops across the city, Voices Behind Bars, Gay Romance NW Meetups, a reading and open mic series, as well as two literary journals. And remember, that’s only been in a year. What will they do in coming years? With your help, everything! At Vermillion tomorrow they’ll also debut Writing on the Wall, a projected installation of over 200 works of poetry and flash fiction (including a dozen or so of my poems); there will also be raffles and reveling and readings. I’ll be reading alongside some incredible writers: Andrea Speed, Terra McKeown, Nick Schwarzenberger, Susan V. Meyers, Laylah Hunter, and Katherine Hervey. I’ll present a piece I wrote in response to a prompt they provided when I read back in December—bearing the bad first attempts and wrong turns recorded in my notebook to show how I finally arrived at the poem. This organization is doing great things for this city. Help them do more great things. Give them money. Buy a ticket to the party. Bring a book for the book drive for the prisoners in their Voices Beyond Bars program. Give them more money. Support them as they support and encourage writers, readers, and the literary arts in the Pacific Northwest.